The Taliban’s announcement on 25th April of another annual ‘spring offensive’ marks the start of the so-called ‘fighting season’ in Afghanistan, dashing hopes of peace talks aimed at ending the 17-year insurgency. It also signifies the Taliban’s dismissal of the latest offer from Afghanistan’s President, Ashraf Ghani, to recognise the Taliban as a legitimate political party and provide them with an office in the capital, Kabul. The Taliban’s springtime campaigns are enabled by Afghanistan’s seasonal geography: snow melt makes the country’s mountainous terrain more navigable, whilst takings from the opium poppy harvest finance the insurgency. Brookings, a US policy organisation, estimates that Afghanistan currently holds 328,000 hectares of opium poppy crops, with 144,000 of which located in Helmand province alone, a heavily Taliban-controlled region. Consequently, collected revenues allow the Taliban to draft a fresh contingent of fighters every spring, a strategy that made the insurgency particularly resilient even during the height of the allied occupation. New recruits are typically drawn from Afghanistan’s dominant Pashtun ethnic group, but the Taliban are now also reported to be reaching out to disaffected Uzbek, Tajik and Turkmen minority communities in the north. 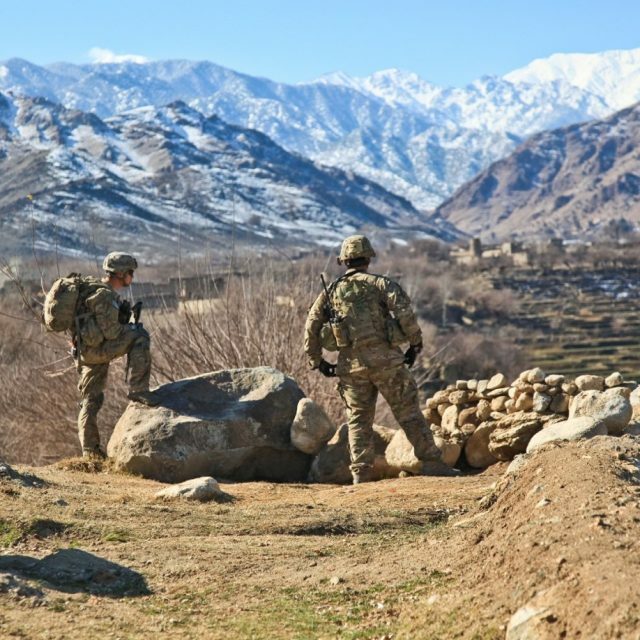 According to the Taliban, the objective of the campaign is ‘crushing, killing and capturing’ representatives of the remaining US occupying force – roughly 14,000 troops in early 2018, with a further 1,000 arriving soon. Whereas Obama’s original exit strategy envisioned stay-behind troops training and advising the Afghan army away from the frontline, the Washington Post understands Trump’s new policy may see troops more heavily involved in ‘some of the most violent, remote and heavily contested areas of Afghanistan’. The Taliban are also targeting ‘internal supporters’ of the occupation: an ambiguous threat that, most likely, simply means a continuation of the violence it has already perpetrated against civilians so far in 2018. January made for an especially vicious month in Kabul, with Taliban gunmen first storming the Intercontinental Hotel, killing 25, before a week later detonating a large bomb outside a hospital in the Wazir Akbar Khan ‘secure zone’ of the city, killing 100. The fact that the hospital attack took place in the securest part of the city will have alarmed patrons of the various Western embassies located there, including that of the US. There are also concerns that the Taliban will target voter registration centres (as ISIS already has, both in Kabul and Baghlan province) as the country prepares for long-awaited elections in October. Strategically, the Taliban’s rejection of Ghani’s disarmingly generous offer in favour of further fighting is interpreted as an attempt to strengthen its own bargaining position ahead of an eventual political settlement. Although elements within the Taliban are thought by the Pentagon to be open to peace talks, the Taliban has stressed that until US troops leave the country, the legitimacy of the Afghan government will not be recognised and negotiations will be sought exclusively with the occupying power. This hard-line stance does not provide a wealth of options, as any US-Taliban talks that exclude Ghani may irreparably undermine the status of the Afghan Government. Meanwhile, given the Government’s thinly spread security forces and the strength and tenacity of the Taliban, a full US withdrawal would sharply weaken Ghani’s hand and cannot, therefore, be a precondition for talks.